Here's something a bit different! 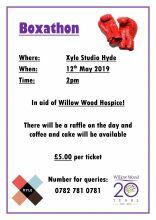 Our thanks to everyone at the Xyle Studio, Hyde who is taking part in the Boxathon - a really different fundraiser. There'll also be a raffle and refreshments will be available during the day. It's only £5 per ticket, and please ring 0782 781 0781 for more information.